Sephora is having their 20% off sale for members of their VIB loyalty program from November 8 to November 12, 2012. During this period, those who qualify as a VIB (annual spend greater than $350 on purchases linked to your loyalty account) can get 20% off any purchase. Needless to say, this is pretty exciting for beauty lovers. We usually go crazy during this time trying out new products, but we wanted to put out a brief recommendation list for those of you who might be looking for some inspiration. Concealer: Laura Mercier Secret Camouflage – GREAT concealer for blemishes and discoloration. Mini review here. Brows: Anastasia Brow Wiz – So easy to use and portable. Mini review here. 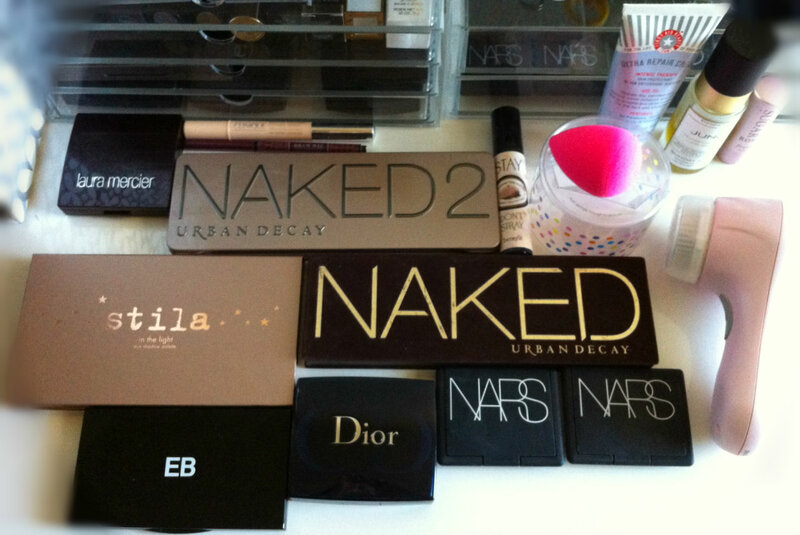 Urban Decay Naked 2 eyeshadow palette. Must have (see here). Facial treatment: Sunday Riley Juno Transformative Lipid Serum – antioxidant-rich oil that leaves skin glowy. Mini review here. Makeup application: beautyblender – your foundation will look flawless on your face! What do you recommend? What’s on your wish list?? Have you noticed that there are more products out with oil as the focus ingredient recently (or maybe I’m just noticing it more)? Mimi has already talked about how obsessed with oils she is, but I’ve just started warming up to it this spring as my skin has been getting extremely dry. I’ve been using some sort of an oil product all over, and I’m really enjoying them! Face – I have combination/oily skin, so I don’t need heavy duty moisturizers. I really enjoy using a face oil as a moisturizer/treatment in the evening. Currently, I’ve been really liking Sunday Riley Juno Transformative Lipid Serum. It is a celebrity favorite and has a lot of great ingredients (such as oils extremely high in natural retinol, Vitamin C, Essential Amino Acids, Omega-3, 6, & 9, UV shields, and natural anti-inflammatory agents). It claims to give “luminous skin and an obsession worthy glow”, and while I would typically scoff at that kind of a claim, IT REALLY DOES DO THAT. It is natural and doesn’t have a heavy scent (which I can REALLY appreciate), but the smell takes getting used to, like oregano or freshly sharpened pencils. And at $125, it’s not cheap. Lola’s Secret Beauty Blog has a great review about it here. However, I still highly recommend this to anyone who wants to try a luxury face oil that, in my experience, actually does what it says. I’ve also used Kiehl’s Midnight Recovery Concentrate before, and for a less expensive option, that one works really great too. It smells like lavender, which I am a huge fan of. Hair – I’ve been using Shu Uemura Cleansing Oil Shampoo, and it smells just like the perfume L’Eau D’Issey by Issey Miyake. To be honest, I prefer a more natural scent, but I wanted to try the shampoo out. It’s paraben free and silicone free. It’s great at leaving my oily hair feel really clean and not leaving a residue, but at $55 for 13.4 fl oz, I won’t be repurchasing without some sort of a coupon code. I’m using up a Phyto conditioner (not anything to write home about) and then using the Shu Uemura Essence Absolue Nourishing Protective Oil when I lightly blow dry my hair. I have pretty healthy hair in general (I don’t dye it and rarely heat style it), so I can’t say if this is THAT nourishing, but it leaves my long hair extremely shiny and smooth. It was also pretty pricey too, but I might consider repurchasing this because I like the results, and the bottle lasts a long time. All in all, I’m pretty happy with these products and will enjoy using them while I have them. Because of their high price points, I’m not sure I would recommend them to everyone, but if these fall within your budget, then I highly recommend trying them! Do you use any oils in your routines?